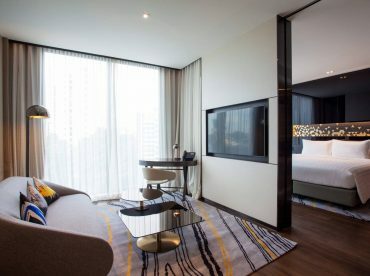 Your high-floor Novotel Premier room gives you premium comfort, whether you’re in Singapore on business, a stopover or a shopping spree. Help yourself to aromatic coffee from your Nespresso machine or a drink from the minibar. Ease into your luxurious Novotel double bed for a peaceful night’s sleep. Your Novotel Premier Room gives you access to the exclusive Novotel Premier Lounge. With welcoming contemporary decor and sweeping views of the lush greenery, it’s the perfect spot for a pick-me-up coffee, an impromptu business meeting or relaxing drinks with friends. Note: Children under the age of 12 are not allowed in the Premier Lounge. Premier guests with children may enjoy the service and benefits at L’Apéritif Tapas Bar on level 1.